I’ve been on a crazy apple kick lately! Within the past few weeks, I have purchased at least four different kinds of apples from the store! I have to ask – since when is there such a diverse selection of apples available? If I’m not looking for a Granny Smith, Yellow Delicious, or Macintosh, I basically have to read all of the labels to decide what kind of apple I want. One of the apples I recently bought was a SweeTango apple. Have you heard of them? They’re a cross between a Honey Crisp and Zestar apple (I had never even heard of the latter). Really good! Then, I had made a trip to one of the local farmer’s markets for some honey and ended up buying some sweet Fuji apples from them, as well! For the most part, I’ve been enjoying my apples cut into slices with thin slices of cheddar cheese as a snack. But now that it’s cool enough to bake again, I whipped up an even better way to enjoy apples this time of year! I decided to make an Apple Pecan Bread recipe with some of the Granny Smith apples I had on hand. I hadn’t made this recipe in years, but I made a loaf to share with my husband this week. I’m not big on sweets, but I could probably do a lot of damage to this apple bread by myself! This bread is cinnamon-spiced with chopped Granny Smith apples and pecans. It’s a perfect treat to enjoy on a chilly fall day with a cup of tea! This is a moist, cake-like bread, but has a nice crunch from the chopped pecans. It tastes like a little bit of fall in every bite! Preheat oven to 350º. Grease a loaf pan with non-stick cooking spray. In a large bowl, beat butter and sugar together on low until light and fluffy. Beat in eggs, milk and vanilla. Fold in chopped apples and nuts. Pour batter into loaf pan. Bake for approximately 1 hour or until a toothpick comes out of the center of the loaf clean. Carefully remove bread from pan and cool on wire rack before serving. I can’t wait to make this!!! This looks absolutely delicious. I might even try it with walnuts. This would be delicious with walnuts! Enjoy! I love apples! This looks like such a delicious bread! Thanks so much! 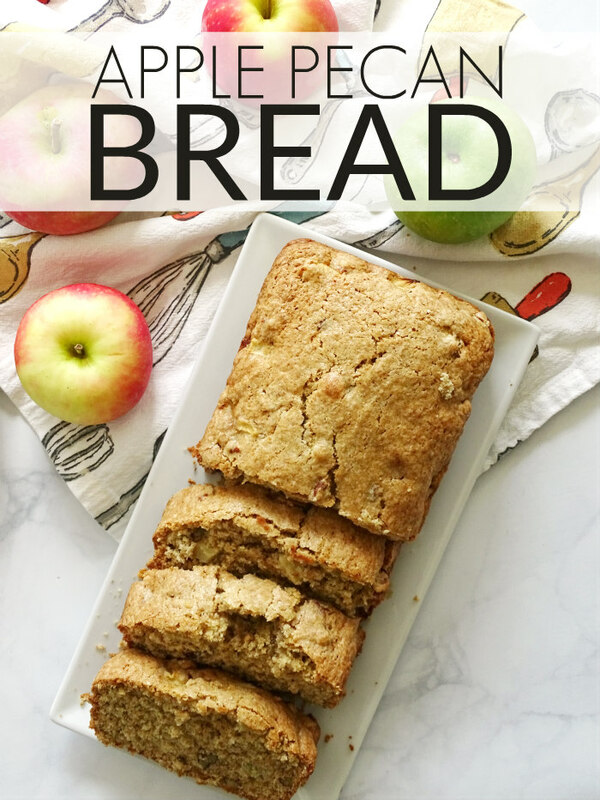 This bread is perfect for Fall and using up apples picked at the orchard! Thank you! I love this as breakfast in the Fall (or even dessert) with a nice cup of tea! This looks so good. I will be trying it soon. Your recipe sounds easy and delicious. Baked bread with apples and pecans is a must for fall. So glad you shared your easy recipe with us at Merry Monday. Tweeting. Yes! It’s one of my favorite Fall combos! Especially after apple picking! I hope you enjoy this recipe! This sounds delicious! I’ve been looking for a good fall bread recipe to try. Thanks for sharing with Merry Monday this week – I’ll be featuring your recipe at our upcoming party. I hope you enjoy this recipe! It’s perfect for Fall! This sounds amazing! I usually make apple muffins during the fall, so I’m sure the family would love apple bread too. Thanks for sharing on Merry Monday. I’ll be featuring this in an apple round-up. Pinned too. I just pinned your awesome Apple Pecan Bread, it looks delicious! I really appreciate you sharing with us at Full Plate Thursday and hope you are having a safe and enjoyable weekend. Thank you so much for pinning! Enjoy this perfect Fall recipe!